Every year between June 15 and July 26, this festival draws lovers of Mozart's music to the Capital of Poland. There are lots of opportunities to enjoy numerous different works by the great composer, the 24 operas, concerts and oratorio performed in original languages. The remarkable interiors of historic places and churches add to the magnificence of the performances. 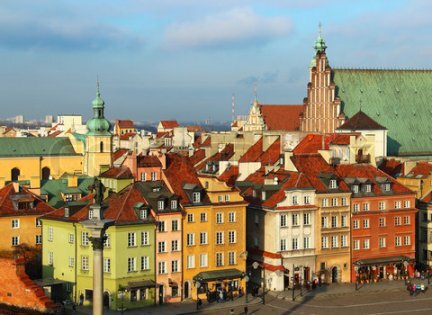 After the festival why not join one of our circle guided tour of Poland to get an overall introduction to this country one of the oldest former kingdoms of Europe. Visit the most important touristic attractions in Warsaw: Old Town with Royal Castle, Market Square and barbican; New Town with Monument of Warsaw Uprising; Royal Route with magnificent palaces, churches and monuments including Presidential palace, Univercity of Warsaw, Holy Cross church with Chopin's heart, Copernicus Statue; area of the former Jewish Ghetto with monument of Ghetto Heroes; historical squares like Bank Square, Theater Square with Grand Opera Building, Pilsudski Square with Tomb of unknown soldier and finally beautiful Lazienki Royal Park with picturesque Palace on the Water and Chopin Monument. This tour includes special bonus: live organ music concert at St. John's Cathedral. This tour of Warsaw a walk in the Old Town, drive along Royal Route. Then we will visit Praga District on the other side of Vistule River: Russian Orthodox Church, St. Florian's Cathedral. On our way back we will admire views of central Warsaw from the Vistula side. Operated daily except Sunday from June 15 to September 30. This tour offers you an unforgettable evening in Grand Theatre of Opera & Ballet or at Warsaw Champer Opera. Best tickets and transportation included. National Opera House - Opera was brought to Poland only twenty years after it first appeared in Florence by Royal Prince Ladislaus IV Vasa. In 1628 he invited to Warsaw the first Italian opera troupe and as soon as he ascended the Polish throne in 1632, had a theatre hall built in his castle, where regular opera performances were produced by an Italian company directed by Marco Scacchi. For over 160 years the Teatr Wielki - National Opera, has been Poland's grandest opera and ballet institution. Its building was erected in 1825- 1833 to designs by the Italian architect Antonio Corazzi of Livorno. Warsaw Chamber Opera - was founded in 1961 by Stefan Sutkowski, who has served as its Managing and Artistic Director ever since. The Warsaw Chamber Opera is pursuing a diverse activity. Its repertoire spans a wide variety of musical styles and genres: from medieval mystery plays to the operas of the Baroque and Classical periods, 18th century pantomimes, the operas by Rossini and Donizetti, as well as works by contemporary composers, several of which were commissioned by the company. Intercity train, with only 2h 40min journey, makes Cracow available for a one day trip from Warsaw. Cracow, the Cultural Capital of Europe of the year 2000 rich in history, outstanding works of art and architecture. The city is the location of the Jagiellonian University [founded in 1364], the Royal Castle and the largest and most beautiful town square in Europe. Cracow is a city complex unlike most others in Europe. This tour includes all programming of tour 9A plus an afternoon visit to Auschwitz-Birkenau, the largest of the Nazi concentration camps during World War II, where 1,5 million people, mostly Jews, perished. It has been the largest death factory in the history of humanity and a silent witness of human tragedy. This tour included all programming of tour 9A plus an afternoon visit to Wieliczka Salt Mine, the oldest salt mine in Europe, an impressive underground world of salt lakes, chambers, galleries and a unique Salt Works Museum, created by many generations of Polish miners. The underground tourist route, goes through galleries and chambers, with 17th and 19th centuries chapels and unique natural crystal caves. The 3,5 hour express train ride, takes you to the complex of three main cities of the Gdansk Bay. Gdansk is a tourist center with the historic complex of the Main and Old Towns. We recommend sightseeing of town houses, gates, churches, the Town Hall, the Artus Court and the Fountain of Neptune infront of it. Enjoy an organ music concert in the famous Oliwa Cathedral and a nice walk along the picturesque Sopot pier. The best place to buy amber souvenirs. magnificent castle location on the bank of the Nogat river. A splendid example of the classic medieval fortress with multiple defensive walls. Labyrinth of rooms and chambers with exquisite architectural details and decorations. Extensions to other European Festival cities are available on request!